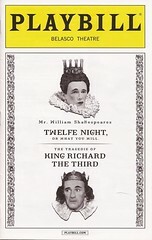 The second show PJ and I saw in New York a couple of weeks ago was William Shakespeare’s Twelfth Night, starring Mark Rylance, Samuel Barnett, Paul Chahidi, and Stephen Fry. This production used an all-male cast, and the sets, costumes, and staging approximated what it might have been like to see this play during Shakespeare’s own time. Twelfth Night is about a young woman, Viola, who is shipwrecked and believes that her twin brother has drowned in the accident. Until she can figure out what to do, she poses as a young male servant and go into service for Count Orsino, who is love-sick for Olivia. Olivia, however, won’t give him the time of day, in part because she is still mourning her brother’s death. Orsino employs Viola (posing as a boy) to woo Olivia for him, but Olivia falls in love with cross-dressed emissary. A subplot involves Olivia’s drunken uncle, suitor, and servants conspiring to play a cruel joke on Malvolio, Olivia’s steward, since he often interferes with their revels. After Viola’s twin brother arrives, mayhem ensues until everyone’s identities and romantic matches are clarified. This was the one play that I had to see during our visit. We saw a Globe production of Measure for Measure with Rylance years ago, which was great, so I didn’t want to miss this show. It is very well done. Most of the actors get dressed and put on their makeup on stage before the show officially begins. There are Renaissance-style musicians, and the set mimics the Globe Theater. There are even wax candles that drip onto the stage from above throughout the performance. But this attention to historical authenticity and similitude comes at the price of contemporary relevance. I couldn’t help but feel distanced from the action, and I wonder if the play has anything profound to say about the human condition today. I’m not sure it holds up in an era of gay rights and gender bending. Even so, Rylance is marvelous as Olivia. And Chahidi almost steals the show as Maria, her conniving servant. Stephen Fry is also excellent as Malvolio. Barnett has the most difficult role: an actor playing a woman playing a man. He does it well, but his part ultimately lacks the zest of Olivia, Maria, and Malvolio. I definitely recommend this production and am glad we saw it. It didn’t move me in the way that The Glass Menagerie did. But, of course, it wasn’t really trying to, so I don’t hold that against it!